1. He composed the operas Jenůfa, Káťa Kabanová, The Cunning Little Vixen, The Makropulos Affair, and From the House of the Dead. 2. In 1975 this man, prominent in California Democratic politics, was appointed Chairman of the San Francisco Housing Authority Commission. The future Speaker of the California State Assembly described him in 1976 as "a combination of Martin King, Angela Davis, Albert Einstein ...and Chairman Mao." But in 1978, he died in bizarre circumstances in South America. His name? 3. What's this place called? 4. It's what we usually call members of the Societas Iesu. 5. A complex and much-debated concept, it refers to struggle -- the struggle to maintain religious faith, the struggle to improve the community, or the struggle of warfare. 6. Who is said to have given back the 30 silver coins before he died? 7. What hard-to-get-to place is shown here? 8. It was called Batavia from 1619 until 1942. 9. 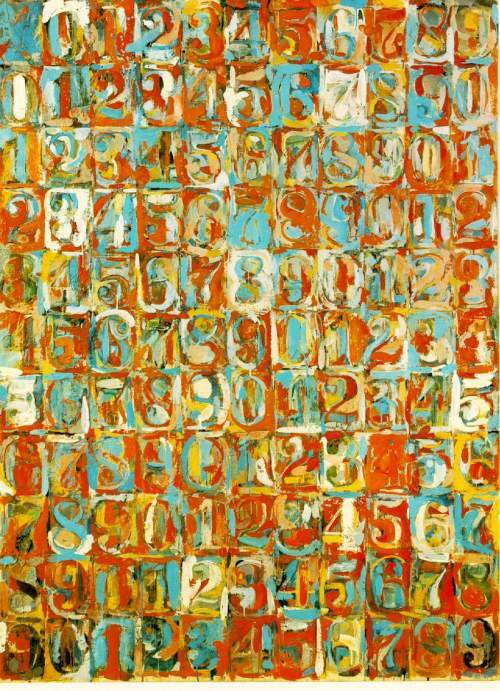 This piece, Numbers in Color, is a well-known work by this living American artist. 10. What author ended a collection of short stories with this passage? It was falling, too, upon every part of the lonely churchyard on the hill where Michael Furey lay buried. It lay thickly drifted on the crooked crosses and headstones, on the spears of the little gate, on the barren thorns. His soul swooned slowly as he heard the snow falling faintly through the universe and faintly falling, like the descent of their last end, upon all the living and the dead. The tie-breaker: Several books of the Christian Bible begin with this week's letter. List as many as you can. Job, Jeremiah, just can't seem to think too well this morning. Wow, this was a killer, composed of things I Just Do Not Know. You know, if I could have escaped the prison of my mind, I could have just brain-stormed 'beginning with J' words and gotten some of these! Duh! 5 should have been Jihad. Gah... remembering why I stopped doing the quiz. 1. I know it's a J from the map below, so, Joplin? No...probably Johann something...Never studie Music and Art History. Sounds Greek or other eastern European. I'll call him "Jenufa-Man!" 2. Jumpin Jehosephat!, that's as hard as the last one! Jennings, Johnson, Jones, Jackson....Let's go with Jones. 3. Land of the Rising Sun, I mean, Nippon, wait, I mean Japan. 7. By Jove, it's Jupiter! 8. Jeez...I better get this one...Is this one of those European countries with a different local name, like how Croatia is Hrvatska? Or maybe a sub-national region...Maybe it's something like Jutland. Not many J's in Europe...my mental European atlas is coming up blank, so Jutland, it is. 9. 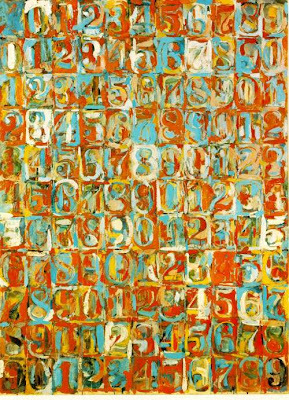 I don't know Art, and I think Jackson Pollack is dead (plus it's not drip-splatter, so I'll go with Jasper Johns. Yeah, that sounds like an artist. 10. That sounds nice, and the Michael Furey sounds familiar. I haven't read much "Literature" since High School, though...What J authors are there? J.R.R. Tolkein I know...Lets be vague and go with Jones, again. 11. (Genesis, Exodus, Leviticus, Numbers, Deuteronomy) Joshua, Judges, (Ruth, 1st and 2nd Kings, 1st & 2nd Chronicles, [and here it gets fuzzy] Isaiah) Jeremiah, Job, (Ezekiel, Daniel, Ecclesiastes, Psalms, Song of Solomon, Zedekiah, Habukkuk); (Matthew, Mark, Luke) John (Acts, Romans, 1 & 2 Corinthians, 1 & 2 Timothy, 1 & 2 [& 3] Peter), (1 & 2? - don't thik so) James, Jude (and Revelations) I'm sure ai missed some...aren't there supposed to be like 53 books? Oops! forgot to go back to #5. Jihad! 1. Jolly Roger, yep, still no idea about music. 2. Jim Jones, hoorah for pervasive American trivia. 3. 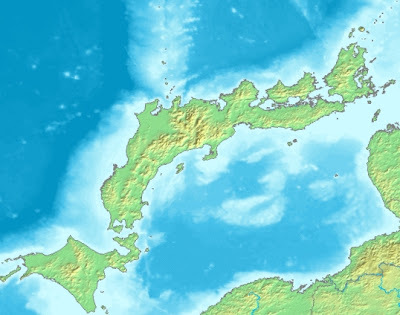 Japan, which appears to have gotten drunk and fallen over. 4. The Society of Jesuits, methinks. 5. Jihad, I guess. I would have no idea if it didn't, you know, start with J. 7. 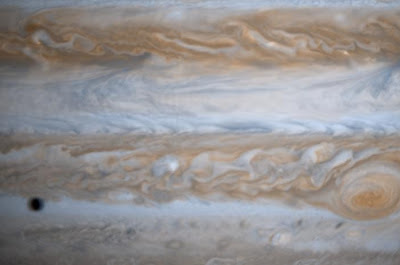 You think that by zooming in you hide the fact that that's Jupiter? Besides, it's not hard to get to, the Jovians skip in and out all the time. 8. Jakarta. Thanks, old school atlas. Joshua, Judges, Job, Jeremiah, Gospel of John, 1 John, 2 John, 3 John, James, Revelation of John? 2. I want to say Jim Jones, but he was more a Communist, not a Democrat if I recall. Can't think of anyone else though, so Jones it is. Hopefully I'm in time before you've posted the answers. I couldn't resist, since the last question featured one of my favorite works of literature. 2. Sound familiar, but I don't recall. Jim somebody. 3. Jamaka, though I can't spell it apparently. 9. I don't know, but I love it. 10. JAMES JOYCE, "The Dead". Such a good story. Judges, John, Jeebus, Joan, Jupe, Jevolation, Jexodus, Jello I, Jello II. Ahh, I see today's theme is "things Aviatrix doesn't know." 1. Weird diacritical marks suggests the guy is like Czech or Bulgarian or something. Do I know any Eastern European opera composers? I wanted to go with Smetana, because it's Russian for "sour cream," but question 4 tipped me off that it's a J-name. Janek, because that sounds like something a Czech musician might be named. 2. California politician who died bizarrely before I had any awareness of politics ... that's ... uh ... hard. Couldn't we go with a politician who died skiing into a tree? Okay, how about Janus Johnson. 3. Sort of looks like Japan, but not quite enough, and I'm going to assume north up. Looks familiar and unfamiliar both at once. If I go with the "things I know nothing about but guessed to begin with S with no rationale" theme, then it's Sumatra. But as it's "J" I turn my computer sideways for a bit decide it is Japan. 4. Jesuits. What, you mean all my S-guesses are wrong? 5. Jihad. Darn it is J. 7. Jupiter. I can never get hotel reservations there. Jenesis, John, Jecclesiates, Judges I, Judges II: Electric Boogaloo, Judges III: Revenge of the Jedi, Jumanji and Jevelations.